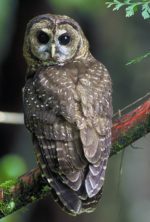 As Figure 1 summarizes, the Northern Spotted Owl decision resulted in a precipitous decline in the amount of timber harvested and sold, resulting in widespread unemployment – and massive fuel load increases in the forests. 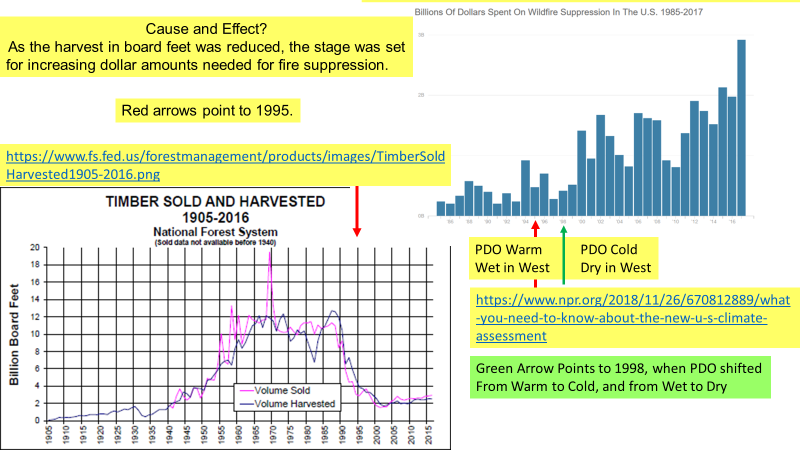 Mere years later, about 1998, the Pacific Decadal Oscillation mode shifted from Warm (wet in the west) to Cold (dry in the west) and the dollars spent on fires shot as high as the flames, as US Forest Service and National Public Radio data affirm. Now a college student, Kelsey Cascadia Rose Juliana tells us that the often-severe forest fires that plague the Pacific Northwest are a result of “Climate Change,” because, “that’s what the scientists tell us.” That this might have been a result of the fuel buildups when logging was stopped in the Spotted Owl case has not entered her head; nor the thought processes of Sixty Minutes’ producers; nor the thinking of scientists, teachers, professors and politicians who “taught” her and Sixty Minutes about fires and climate change. Although many other scientists could have explained the clear link between fuel buildups and massive conflagrations in forests where timber thinning and cutting are prohibited, they were not consulted. 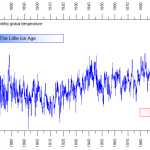 Al Gore told us to examine ice core data. That prompted me to become a student of ice cores, from both Antarctica and the Arctic. 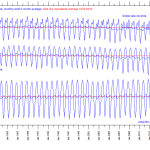 Figure 2 presents the temperature time history derived from the GISP2 ice core in Greenland. The data show that there has never been a Halcyon Time of climate stability during the past 5,000 years; that temperatures were warmer (and sea levels were a lot higher) in the Roman and Minoan Warm periods; and that the present temperature and rate of change of temperature today are not in the least extraordinary. Figure 2. 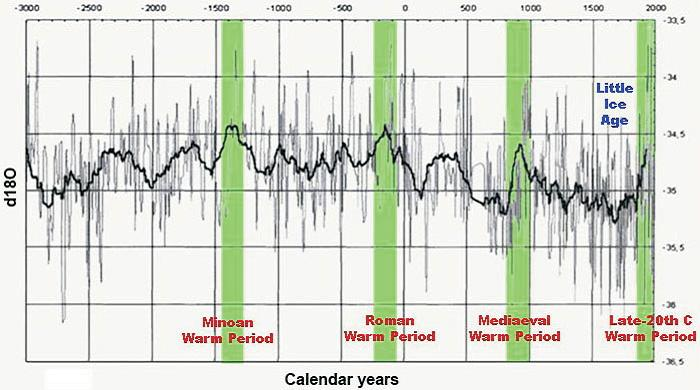 Temperature time series from the GISP2 ice core, showing the past 5,000 years of temperatures with Minoan, Roman, Medieval and Late 20th Century warm periods highlighted. Source: http://www.greenworldtrust.org.uk/Science/Images/Main/Warm_periods.jpg. It should be obvious that humans cannot “stop climate change” that is in fact a natural aspect of Earth’s environment. Embedded in the comments under the original CBS video link is a 17 September 1969 memo by Patrick David Moynihan, an advisor to President Richard Nixon. Moynihan warned of a 7 degree F temperature increase by the year 2000, which would result in a 10-foot sea level rise and the flooding of New York City and Washington DC in the same year. Like most climate change predictions, it was quite obviously a busted forecast. The basis for the CBS interview is fear expressed by the kids. To make their program seem objective, Messrs. Croft and Mihaljevic make a big point of emphasizing, and then discounting, the possibility that adults might be using the kids as props to drive a climate and fossil fuel agenda. The attempt fails. They are clearly trafficking in the emotion of fear. 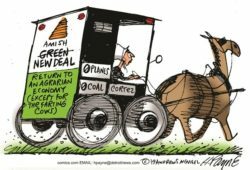 Indeed, the lack of objectivity is palpable, but only if one is schooled in Earth Science, instead of the propaganda evident in this program, numerous other media stories and the bulk of climate discussions. This CBS report is a textbook example of such propaganda. 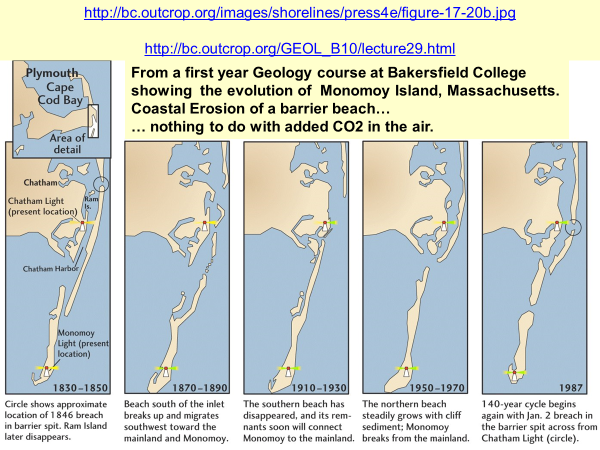 Figure 3, from a Bakersfield College geology course, shows the evolution of Monomoy Island, Massachusetts, over the last two centuries. Without even getting into what this area might have looked like 12,000 years ago, just before the last Pleistocene glaciers began to retreat and the Atlantic Ocean was some 400 feet shallower than it is today, it is obvious that Monomoy has been anything but stable. Figure 3. 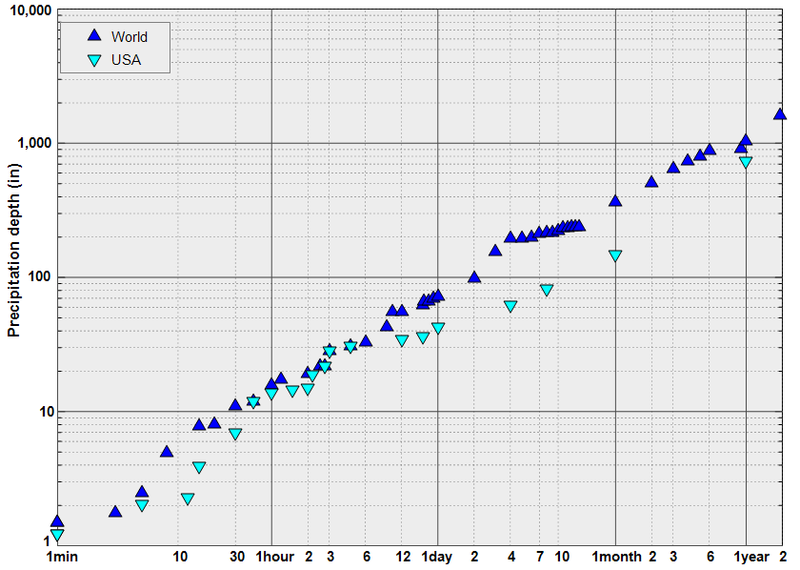 Time evolution of Monomoy Island, Massachusetts, at the elbow of Cape Cod. Maps from the past two centuries show that barrier islands like Monomoy Island are ephemeral structures, subject to coastal storms, especially strong storms at high tide. CBS producer Mihaljevic says not a word to suggest that a kid living on a barrier island anywhere along the hurricane-prone Atlantic coast today somehow faces environmental threats not confronted by kids on the Atlantic or Gulf Coast mainland. Indeed, the CBS video of young Levi Draheim was shot on a sunny day with light winds, an ideal beach day with nary a hurricane or thunderstorm in sight, leaving the subtle impression that the only threat he should fear is seas that are rising ever faster because of man-made climate change. 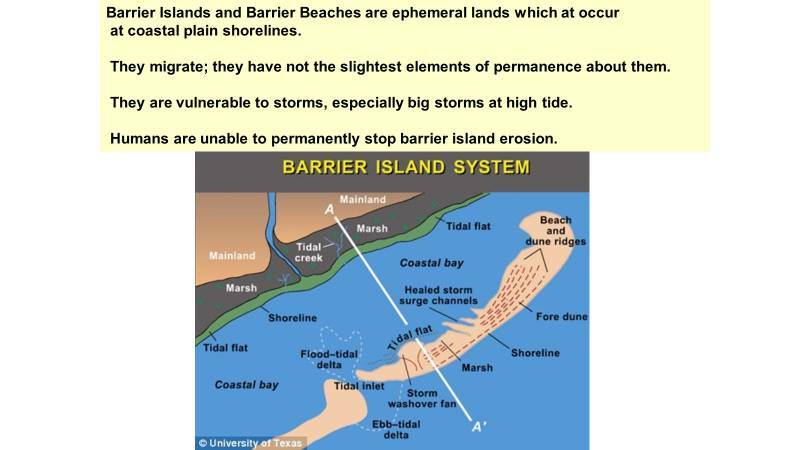 Figure 4, from a University of Texas Earth Science course, illustrates similar barrier island lessons for coastal areas in the equally hurricane-prone Gulf of Mexico. Figure 4. Graphic illustrating the features of Barrier Island Systems from the University of Texas showing they are characteristic of flat coastal plains. That Sixty Minutes should not recognize the peril of exposing permanent resident children to life on barrier islands seems studied ignorance of obvious environmental hazards. 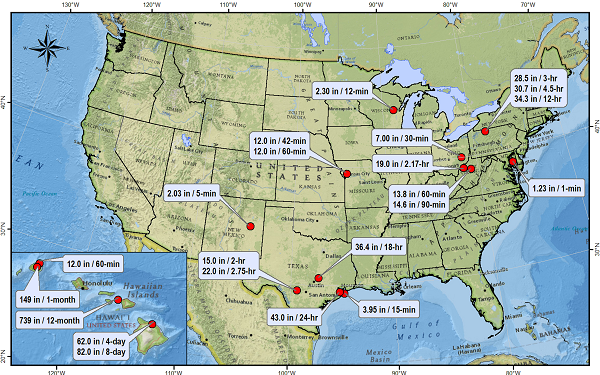 Just a few minutes of internet searching will uncover substantial data on extreme rainfall events in the USA. Some are displayed below in Figure 5. Nationwide data plotted on a US map underscores this fact. 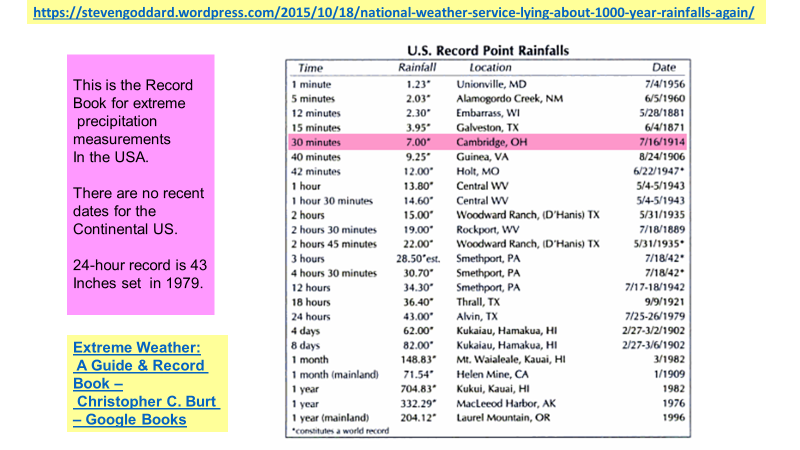 Heavy rainfalls, of almost unbelievable amounts of water from the heavens in a very short periods of time, have occurred with great regularity in many parts of the United States for at least the century during which quality records have been kept. Figure 7 displays this very well. Tropical Storm Amelia dumped 48 inches on Texas in 1978. Tropical Storm Claudette inundated Texas with 54 inches in 1979 – and deluged the little town of Alvin, Texas with 43 inches in just 24 hours; that one-day record still stands. 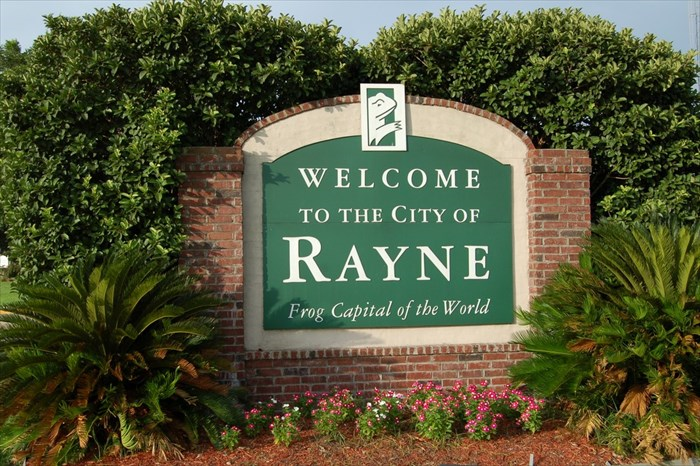 Houston’s Buffalo Bayou flood water level topped out at 62.7 feet during Hurricane Harvey in 2017 – but its waters reached 54.4 feet in 1935, when Houston had far less concrete and (relatively, for this mostly flat, low-lying city) better drainage. When a strong tropical cyclone has access to abundant moisture evaporating from a large body of warm water like the Gulf of Mexico – and that situation combines with little inland movement by the cyclone – you get record rain, climatologist Dr. Roy Spencer has explained. That doesn’t always or usually happen, but history shows that it nevertheless happens with some regularity. The irony here is too rich not to discuss. Juliana’s parents and environmentalists, politicians and courts teamed up a few decades ago to file lawsuits that blocked timber sales and cutting, thereby causing a gradual, but enormous buildup of diseased, dying and dead trees, brush and other highly inflammable materials. Huge, deadly conflagrations inevitably ensued – and now the same parties blame climate change for the infernos, enlist their (indoctrinated) children as sympathetic plaintiffs, focus on the kids’ deep fears, and sue fossil fuel producers for damages. Is there such a thing as criminal hypocrisy? That makes it clear that fossil fuels, CO2 emissions and “manmade climate change” have nothing to do with rising sea levels. Moreover, seas are rising today at 7-12 inches per century, which is hardly a valid cause for alarm for most technologically advanced societies. In addition, in many instances, as I explained in a previous MasterResource.org article, assertions that sea levels are rising often mistake land subsidence as evidence of rising seas. Figure 8. 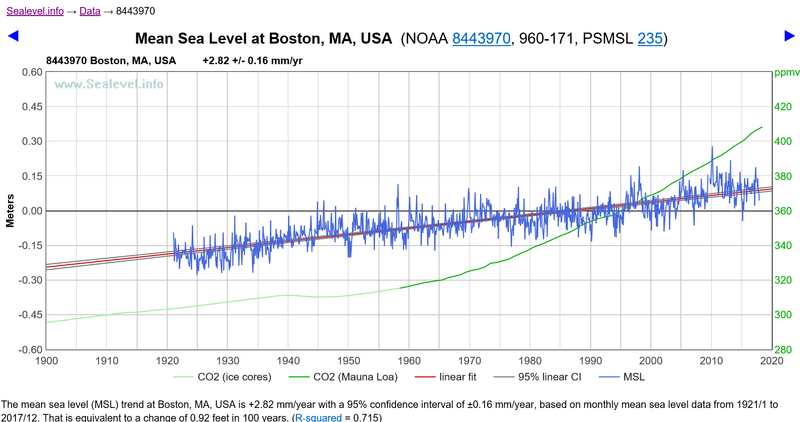 Sea Level in blue and atmospheric carbon dioxide (CO2) in green, from SeaLevel.info data compiled by the National Oceanic and Atmospheric Administration’s (NOAA’s) tide gage at Boston, MA. The rate of sea level rise is essentially unchanged over the past century and more, even as CO2 levels climbed, and then accelerated in their rate of increase, especially since the 1960s.